How to furnish a new architectural icon? How to tackle the design for such a spectacular venue? What common features do the highly different rooms backstage, the stage management workstations, the offices and the meeting rooms, not to mention the changing rooms for the orchestras, the suites for the soloists and conductors, the lounges and the foyers? Designer Eva Marguerre paints an apt picture of the scope of her project: “Were you to turn the Elbphilharmonie on its head and shake it, then everything that would fall out would have been chosen by us, everything inside would be by Herzog & de Meuron.” Not until January 2015, once the scandals surrounding responsibilities and financing had been solved, was the team composed of Daniel Schöning of Büro WRS Architekten and the two designers Eva Marguerre and Marcel Besau (Besau-Marguerre). Discreet assistant during the interval: Upholstered bench and side table “Elbe”, both courtesy of Studio Besau-Marguerre and Daniel Schöning, in the Grand Hall lobby. Initially it was only Schöning, who was commissioned to select furniture classics for the new build. Because then everybody would be happy, so the initial idea. However, the architect , who had at his company handled the design of the hospitality outlet at Laeizhalle, proposed an alternative approach. “You have to see such a project culturally, too,” he says looking back. The Elbphilharmonie as a project sets a standard that needs to be met by the fit-out. He posed some of his considerations as questions: What does Hamburg offer? 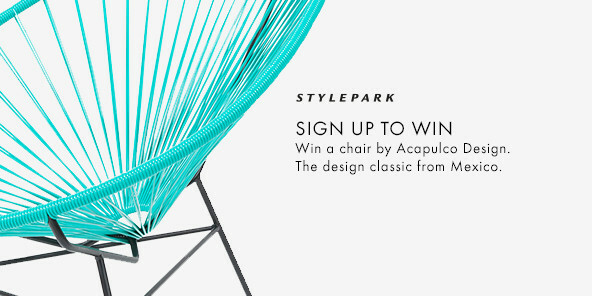 Are there young designers here who can be involved? 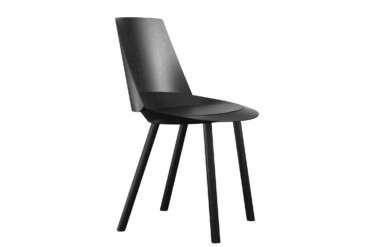 Could there not be furniture items that could be purpose-developed for the Elbphilharmonie? Those involved and the developer soon realized that just selecting choice items from a furniture catalog would not suffice. 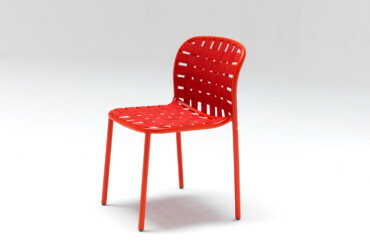 Schöning approached Marcel Besau and Eva Marguerre, who were initially only expected to introduce him to the design scene, but swiftly became project and design partners. Almost the same in black: In the foyer of the Small Hall, architects Herzog & de Meuron relied on dark woods and created an impressive black bar. It swiftly became clear that despite a limited budget and an array of objects a design guideline was needed to avoid any arbitrary decisions or me-toos. The guideline was meant as a “reference that could serve as the policy when coordinating decisions together with the developer,” Marcel Besau remembers. The design team formulated three starting points: 1. “Sense memory”, a concept from the neurosciences and Method Acting. The selected products were to exhibit specific properties haptically and in visual terms that lodged them in people’s memories. 2. “Arts & Technology”, nuances between artistic and technological innovations were to be apparent; and 3. “One color”, a uniform color for all objects to emphasize their design coherence. On the basis of this concept the trio then developed ideas for “de-coloring”. 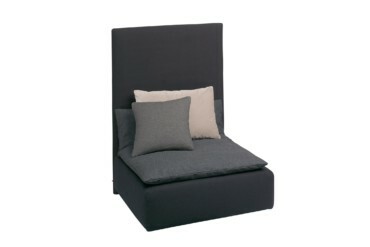 The selected furniture items are usually only white, in all manner of shades or close to nature. 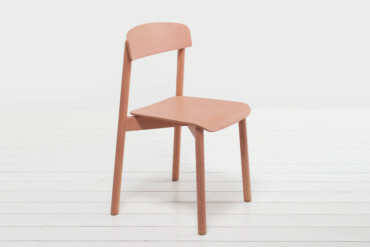 Here, “One color” means precisely not a uniform color tone applied to all items, but a kind of “de-coloring” that ensures the materiality and tactility becomes strongly apparent – such as the wooden grain of a table. 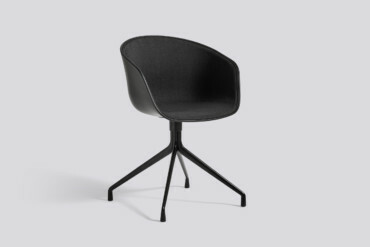 Scandinavian round table: Hee Welling’s “About a Chair” for Hay was upholstered in the “Basel” fabric that Herzog & de Meuron designed for Kvadrat. 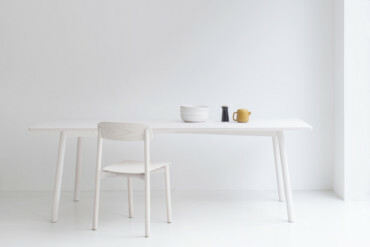 The “Edi” table was dreamed up by Claesson Koivisto Rune and manufacturer Nikari. Instead of classics, the designers mainly chose contemporary works by designers active in the business. For the artists’ reception zone there is Kraud’s “Stuhlhockerbank”. The “Profile Chair Solid” and “Profile Table” by Sylvain Willenz for Stattmann Neue Moebel are to be found in the artists’ lounge and the changing rooms for the soloists and conductors. The artists’ lounge is also outfitted with KaschKasch “Sidetable Round/About”. Throughout the building there are accessories by Hamburg designer Alexa Lixfeld. In the “Circle Lounge”, which can be used for various purposes, the compact “Lift” armchairs by Eric Degenhardt for Böwer and the “Shiraz” sofas by Philipp Mainzer and Farah Ebrahimi (e15) are deployed. 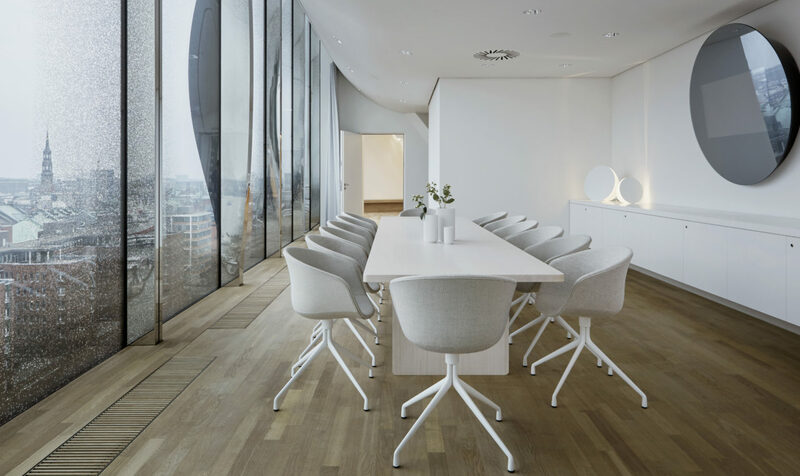 The “Skandinavia Edi Table” conference table designed by Claesson Koivisto Rune Architects for Nikari was taken for the Green Room. On the Sky Lounge patio the architect and the designers went for the “Yard” outdoor furniture series by Stefan Diez for Emu. And Diez’ chair “Houdini” and his “Leo” armchair are likewise to be found in Elbphilharmonie. Vases from Hamburg label “We are Studio Studio” are to be found in the Sky Lounge. Variable and exclusive: In the “Circle Lounge” on the 13th floor, members of a business club and their guests convene. The room features “Shiraz” sofas by e15 and compact “Lift” armchairs by Böwer. The designers and the architect spent some time searching for a suitable standing table, an upholstered bench and a side-table for the foyers of the Small and the Grand Halls. The architecture creates many visual lines as the Grand Hall’s flowing foyer space extends across four stories. The designers focused on furniture items with complementary shapes. Such products did not exist, so Besau-Marguerre and Schöning designed them. The three almost tender small items are far more robust than you might think at first sight. They do not get engulfed by the space, but are slender enough to stand along the unusually shaped windows, the lively corridors or the large spaces. Each table boasts a round marble top, the benches slender upholstery. The parts subject to the most wear and tear can be replaced. The bench is, like many of the items chosen, covered in “Basel”, a fabric created by architects Herzog & de Meuron. 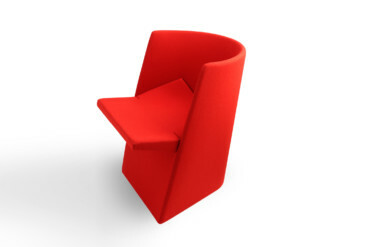 The furniture series will soon be mass produced by a well-known Frankfurt-based company. 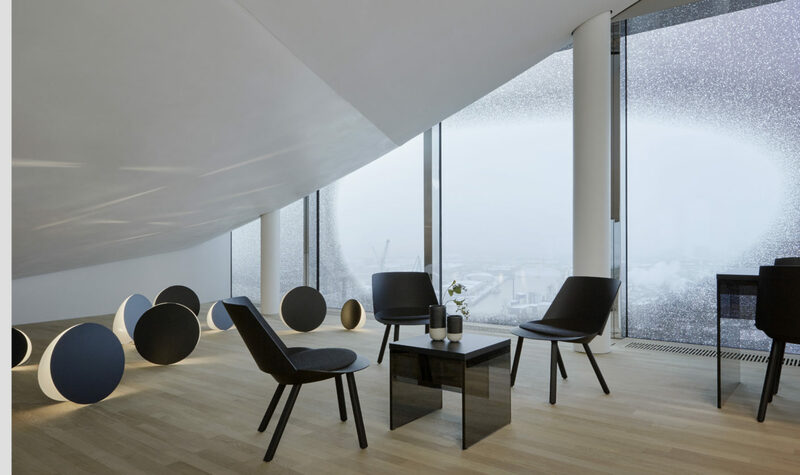 For the VIP lounge at the top of the Elbphilharmoniegestaltete the team chose a series of black glass and wood tables. 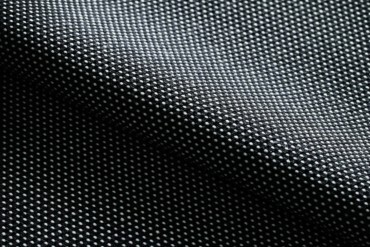 The glass base is made of black glass and multi-layering means different degrees of transparency, from translucency to complete clarity. The table surfaces form solid black wooden tops. 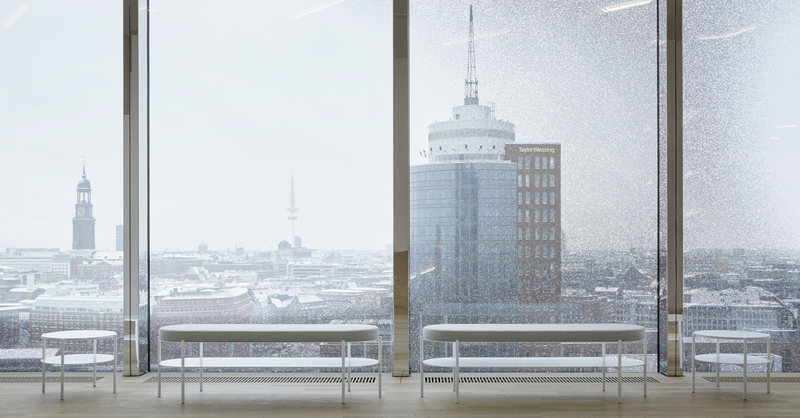 In this way, the furniture design by Daniel Schöning, Eva Marguerre and Marcel Besau in the interior of the Elbphilharmonie interacts excitingly with the architecture and supplements the polyphony that will soon be to be heard here. 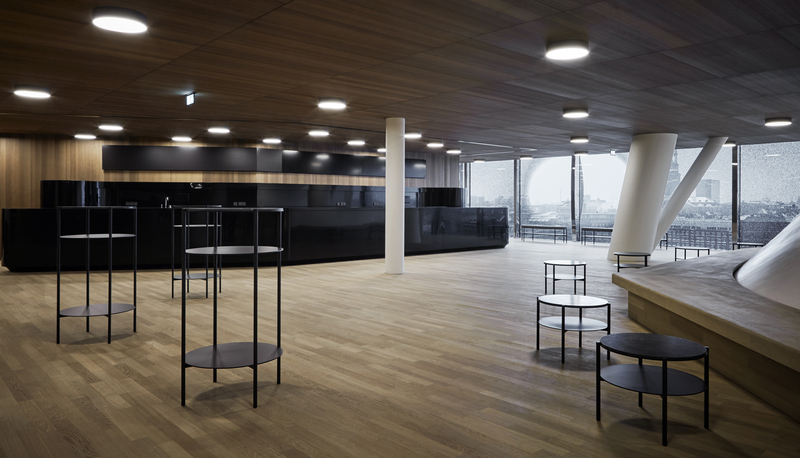 VIP lounge with a nocturnal look: Like the glass and wood tables designed by Studio Besau-Marguerre and Daniel Schöning, all the furniture including the bar in the “Sky Lounge” is in black. 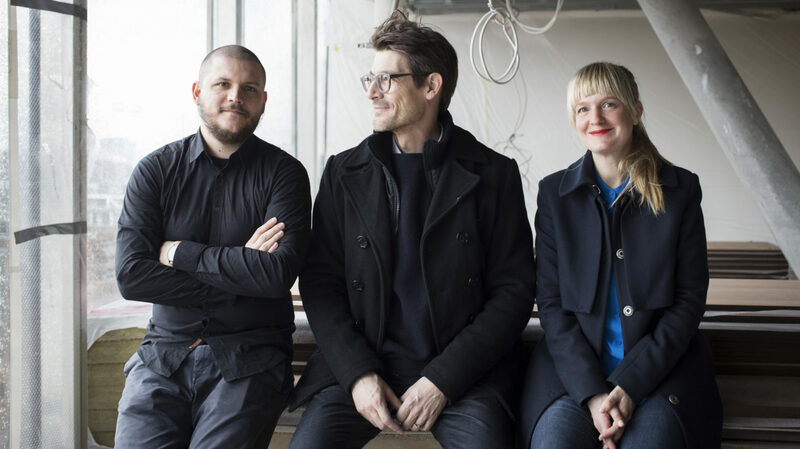 Selection, fit/out and designs: The creative team consisting of Marcel Besau, Daniel Schöning and Eva Marguerre started work back in 2015, when the Elbphilharmonie was still a construction site.